I’ve just sent back the Fujtsu Q702 hybrid. It was a great, productive all-rounder (Review here) and is also available with Core i3 and without VPro for much the same price as the Ultrabook I’ve just started testing. 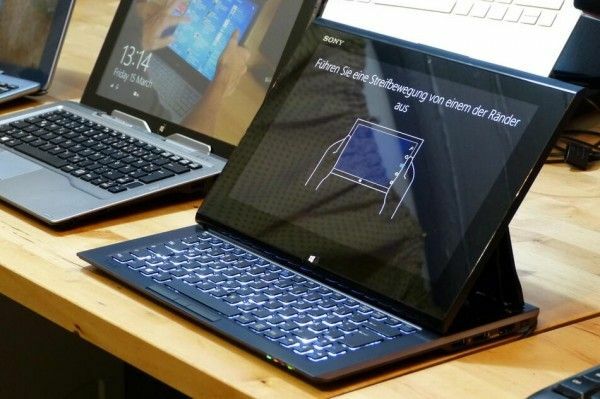 The Sony Vaio Duo 11 also fits many of the same user profiles as the Q702. It’s fitted with a digitizer, converts to a tablet and has a great set of ports. My first impressions are generally positive. I’m really impressed with the looks of the Sony Vaio Duo 11 but there’s a lot more to talk about than just the aesthetics. The screen is incredibly bright and sharp and because of the slider design it’s more stable than any other style of convertible when open which means you can really use touch and the digitizer with confidence. There are other positives too, and one huge negative because it only ships with a 39Wh battery. The Q702 has double that! I immediately noticed that the Vaio is a fully capable Ultrabook that doesn’t suffer from the same thermal limits of the behind-the-screen style of mainboard placement (tablets.) Turbo Boost works well and initial performance test results are up there with the best of the sector. Back to the screen and working fascia – it’s impressive but suffers from the same issue that you’ll find with all sliders. The keyboard area is small. 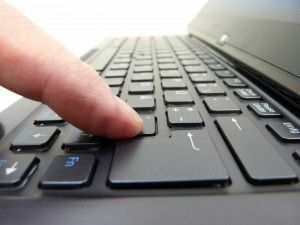 I don’t feel 100% confident with the keyboard at the moment but I have to admit that writing this post has been easier than I though it would be. The keyboard backlight helps and now that I’ve ‘ranged’ my fingers, it seems to be acceptable. The optical mouse pointer however is not so nice. I’ll have to test out a few different techniques in this area. I’m using a mixture of touching the screen. cursor keys and digitizer pen at the moment. The digitizer layer and pen on the Sony Vaio Duo is excellent and really helped by having the most stable screen design possible. It’s locked into position and is stable enough to take full pressure on the pen without bouncing or tipping back. It’s great design for those wanting to use a pen. For those not wanting to use a pen you might be encouraged to try with the full HD screen as text and selection boxes tend to be smaller. Speakers are good which indicates some good engineering effort even in areas that often get ignored. NFC, location sensor (full GPS), Centrino 6235N WiFi (including WiDi and WiUSB) and TM module add to the good spec list. As for the disk speed – excellent although there’s only 61GB of 128GB free on this test device – a shocking loss of space out-of-the-box. 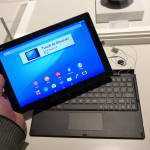 As a tablet the Sony Vaio Duo isn’t that impressive. Sharp edges and a 1.3KG weight make it awkward although the screen is so bright and punchy it makes sense to be using the tablet to demo videos and images. In that respect it’s not bad – and a lot better as a presentation device than smaller tablets. The Sony Vaio Duo is fitting in well to my home life. During working hours I’ll attach an external screen, keyboard and mouse and then, in the evening, I’ll be perching the unit on the side of my armchair for a surprisingly stable solution. It will work well on short outings and would work well in the hotel scenario. [I’m away next week – the Vaio Duo is likely to accompany me.] It’s stylish too. I’d be quite proud to be using this in any public place! 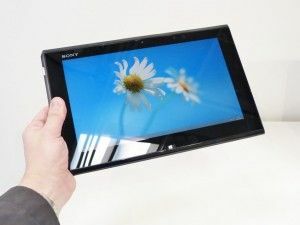 For longer-term mobile usage though, the Sony Vaio Duo might not be perfect. I’m not talking about battery life because the extended sheet battery can be added, charged standalone and even includes a pen slot. No, the biggest problem could be that hinge. It looks extremely complex and must be treated with respect. Having said that, I also have my reservations about hybrid docking connectors too! Would the mouse be better if it was a trackpoint nub vs an optical trackpad? Does the screen have adjustable angles? Do you think that exposed ribbon cable is likely to break after long term sliding use? How big (physical and capacity) is the extended battery? Mousepad would be better as a trackpoint nub as you can fine-control it better. Screen is fixed-angle but screen has wide-angle viewing so it’s not a big issue. Can’t comment on that ribbon cable except to say that i’m worried about it. Extended battery is another 40W and fits across the back rear. Have a search for Vaio Duo extended battery and you’ll see it. A rubber trackpoint would have been preferable. This review is really what I want right now. I’m so glad that you have come up with this device. As you can see, this is one of my best candidate for my laptop replacement. So, your review will be very helpful to me. Hello Doddy. 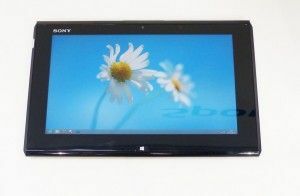 If you really need a digitizer layer only then should you go for Sony VAIO Duo 11. At 11.6″ full HD display will make the text look so small that you’ll have to get a magnifier glass or use Magnifier desktop app. You could adjust the text size in Control Panel, but it doesn’t work in all scenarios. Other solution includes adjusting the screen resolution to 1600×900 or even 1366×768, but that defeats the purpose of having a full HD screen that only looks nice when watching HD movies. Go for Ideapad Yoga 13, which has a decent screen resolution of 1600×900 (perfect for a 13.3″ screen). 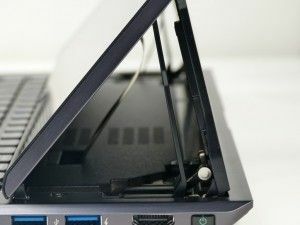 If I/O ports is what that matters you the most (since you’re looking for a laptop replacement), Dell Inspiron 15z will be your perfect device which, though lacks a convertible form factor. But it seems that you’re ready to compromise on DVD-Drive, so Thinkpad Twist is a great solution. It doesn’t have a digitizer and only has a 1366×768 screen resolution, but is great for those who just want to have a convertible touchscreen device at a reasonable price of $900. Read the reviews of above mentioned ultrabooks at ultrabooknews.com so that you completely understand what you really want. Hi ramesh, thanks for your comment. My previous laptop was 4-year-old 13.3″ Toshiba M800. Actually, I can’t see that I will have another laptop that bigger than 13.3″ in the future. So, the device should have at least a support on digitizer pen, intel i-core, good port selection, and tablet function. 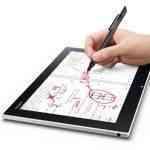 If Asus Transformer Book supports digitizer pen, It will be my first choice over than Vaio duo. I have seen other device such as Surface Pro, but it was too small (10.6) and no extended battery, ATIV pro has some issues on dock and low benchmark point. I’m really glad to have some suggestions regarding to my comment. Also, will wait for the future review from Chippy on Vaio Duo. Further testing this morning and i’ve been fairly productive. As for the screen resolution, there’s a little advantage to be considered. The slider mode brings the screen closer to the user than normal. Working in a browser isn’t bad either as the font sizes can be zoomed easily. The digitizer really helps get accuracy on the screen too. Oh and I can’t understate the stability of the screen. Ill be honest, i had not considered this as a feature of the slider design before but its a big one for anyone wanting to use a digitizer. The dissadvantage of course is the smaller keyboard so the Vaio Duo is really for people not doing a great amount (i mean 1000’s of words or more at a time) typing. Thanks for appreciating my comment. Given your needs, I would like you to consider the upcoming Thinkpad Helix. It has same screen size as that of VAIO Duo 11, has a digitizer, runs on latest Intel core i5/i7 processors and has great port options. Moreover, it’s a dockable convertible that has a fan attached to the clamshell, which cools down the internals of the tablet when docked in, which means maximum performance out of Turbo Boost and works just fine for web browsing in the tablet mode. With most of the ports available on the tablet, you might even forget to take the clamshell except when you need to do heavy duty work. Price is what might keep you from buying it as base price starts from $1599 while Duo 11 is tagged at $1199. If price isn’t a factor, it’s worth waiting for Helix. Besides, it’s a Thinkpad, so the keyboard has to be better than Duo 11.
saw it in our local dealer store and could compare it to other slider ultrabook tablet combos. 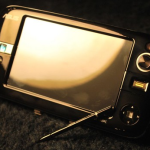 the design and the mechanical layout in comparison appears so izzy dizzy amateurish realised (and this for a sony device) that it is looking more like a test prototype than a serious end product. for me an absolute no go. Are there any, sliders with a trackpoint that have the main board on the screen section assuming it’s balanced somehow? I ask because I’d like to keep the keyboard bottom cool for my lap, a couch or some other non-hard surface. As a Duo owner since day one (quite literally), I can tell you the hinge is not an issue. The Duo has been all over the world with me – I travel a lot for work. I run multiple VMs on it. I love the optical trackpoint – I’ve never loved trackpads and I usually wear out traditioonal nubs. The typing comment is utter BS though – I write TONS of documents on it (including working on my new book), but it is a love-it-or-hate-it kind of thing. 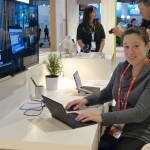 You also have to realize that having a VGA port for someone like myself who presents a lot is a crucial piece of the puzzle – not many in this category have one. It’s HDMI or needing some sort of external dongle. Also, this form factor is great on a plane, too. Finally, I buy vaio duo 11. No problem at all when typing.. The optical is not that “bad”. At least not a big issue for me. Really, really stable when using stylus. Great for notetaking!! Simply export your pdf+ppt to one-note, and thanks to pen, you will not need to print all your handout to your class again. The quiet fan is also a bonus for me. Deserve to be one of the best, if not the best, Win-8 with stylus device. 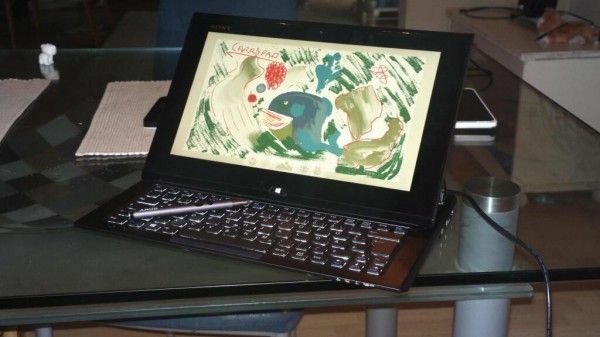 I have tested a sony vaio duo 11 three weeks… and i send it back in the 4. … because… screen has burnin effects on corners… webcams are a hell of crap quality… mic sounds like it is build in the system-fan… keyboardbacklight is not well balanced an blinds… and the screen frame is cheap plastic ..scratches… no bad device ! I have had my Sony Duo-11 for 2 months now and I am extremely happy. I am 60 years old and have found it trivial to adjust the font settings such that everything I do is legible and easy to use. I have the core i7 model, the slate battery and the 256GB SSD model. My soft case just arrived from Sony yesterday, so now the package is complete. It works great in my lap in “keyboard exposed” mode and fantastic as a really quick tablet resting on the arm of my recliner. I love the full-size ports and wouldn’t trade this unit for any of the other form-factor convertible Ultrabooks on the market.